Cerro Gordo Mountain is located six miles east of Cottage Grove, Oregon. It overlooks Dorena Lake. Anyone in downtown Cottage Grove can see Cerro Gordo Mountain standing in the distance down Main Street. The words "Cerro Gordo" are Spanish and mean a large or rich hill. You might wonder why a mountain in Oregon would have a Spanish name (the name of "Cerro Gordo" is found in at least six states.) How a place gets its name is often fascinating and sometimes controversial. There are at least three different origins for the name of the mountain called Cerro Gordo in Lane County, Oregon. In 1919, the Cottage Grove Sentinel ran a series called Footprints of Old Pioneer Days. This series retold early tales of the area while they were still within the people's living memories and could be corrected in follow-up columns. The entire series contains invaluable historical tidbits of South Lane County told by people who had lived them. 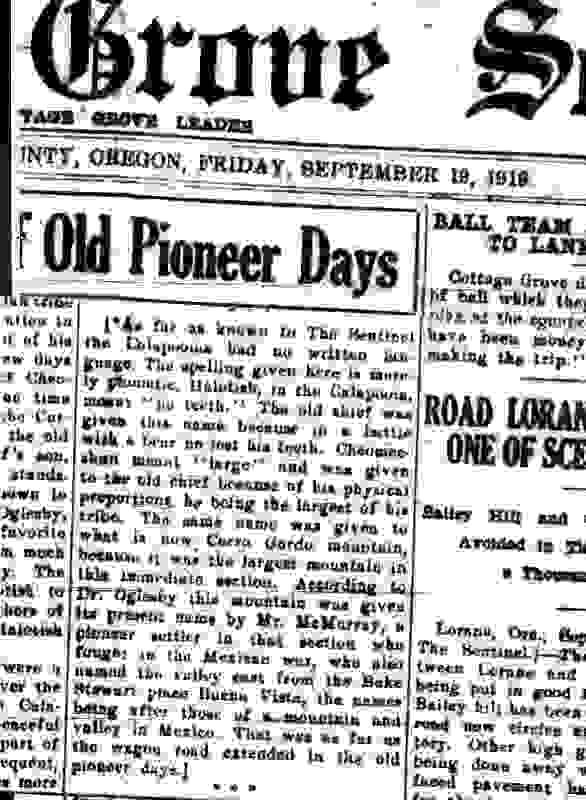 Here is a Cottage Grove Sentinel newspaper article from September 19, 1919. It says that our Cerro Gordo was named for a major battle in our war with Mexico. Pictures of both mountains show a striking resemblance (see below). Local Kalapuya Indians are also said to have called the mountain "Cheomecshun," meaning "large" because it was "the largest mountain in this immediate section." The 09/19/19 newspaper article goes on to say, "According to Dr. Oglesby this mountain was given its present name by Terrence and Nancy McMurray, a pioneer settler in that section who fought in the Mexican War and also named the valley east Buena Vista, the names being after those of a mountain and valley in Mexico." Here is a link to Oglesby's biography in Portrait and Biographical Record of the Willamette Valley, Oregon. Oglesby, arrived in the Cottage Grove area in 1853. Dr. Oglesby died in Lane County in 1920. He wrote many articles for the Cottage Grove area newspapers and was widely respected for his knowledge of local history. When the article was written there was still a Cerro Gordo train stop on the OP&E Railroad near today's site of Dorena Lake. Cerro Gordo and Buena Vista were the names of the US's two biggest victories in our 1847 war with Mexico. They were the largest battles our nation had ever fought until that time. Below are pictures and web sites about Buena Vista and Cerro Gordo. Buena Vista is in northern Mexico and Cerro Gordo is on Mexico's east coast near Vera Cruz. For many years, locals called the mountain "Rattlesnake Hill." Longtime residents can recall when the Dorena Lake dam was built in the late 1940's; rattlesnakes slithered all down the mountain, brought out by the builders' dynamite blasts. Many people in Cottage Grove still called the mountain Rattlesnake Hill in the 1970's when I moved to the area. When the water is low in Dorena Lake you can still see traces of the old railroad in the lake bed. Lewis McArthur's book of Oregon Geographic Names says our Cerro Gordo was named because it turns golden brown in the summertime, and only "possibly" for the battle. The book credits Mr. John Veatch with this story. It is true that Cerro Gordo was golden brown in the summer, but the grass on most all Oregon hills turns brown in late summer. Plus, the words "Cerro Gordo" do not mean any color at all in Spanish. 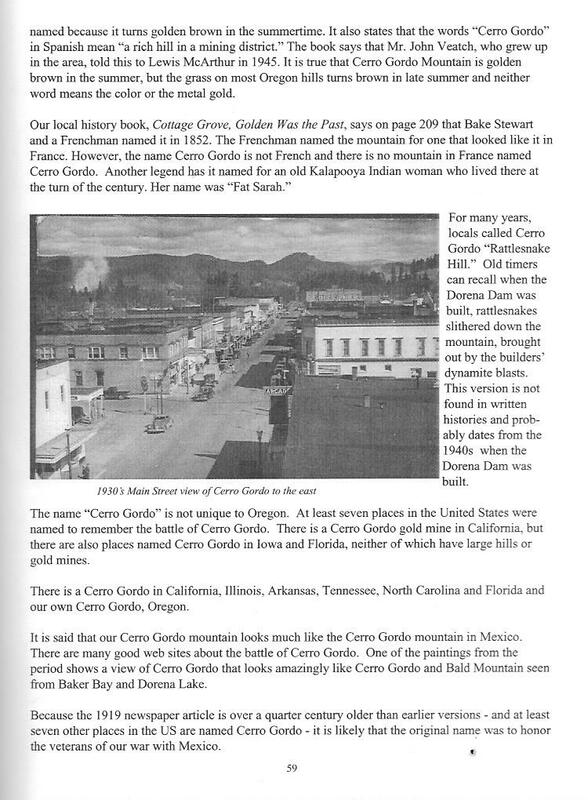 The book also says that the words "cerro gordo" mean "a rich hill in a mining district". But, the nearest gold mine is over twenty miles away! There is a gold mine named Cerro Gordo in Mexico, but there has never been mining on Oregon's Cerro Gordo. The Cottage Grove Historical Society's book, Cottage Grove, Golden Was the Past, Volume One, says on page 209 that early settler Bake Stewart and a Frenchman named it in 1852. The Frenchman named the mountain for one that looked like it in France. However, the name Cerro Gordo is not French and there is no mountain in France named Cerro Gordo. A few French loggers did live in the Row River Valley but it's not likely they gave a mountain a Spanish name, Cerro Gordo. It would more likely be given a French name. Another story, in Golden Was the Past, Volume One has the mountain named for an old Kalapuya Indian woman who lived there in the late 1800s. Her name was Sarah (page 225) and she is said to have been "fat." Hence the name "Fat Sarah" which over time becomes "Sarah Gordo" and then changes later into "Cerro Gordo". That is a very large linguistic jump! It is true there was an elderly Indian woman named Sarah who lived at the foot of Cerro Gordo Mt. (p.225.) She lived on Cerro Gordo when the Doolittle family owned it. They called their 1200 acre homestead "Paradise Hill." I have spoken with two members of the family who told me of Sarah living there when they owned the land, but the mountain itself was called "Cerro Gordo" years before the Doolittle family bought it. The Sept 1919 newspaper article mentions Indians around Cerro Gordo, and their chief, Halotish, but it does not mention Sarah. I moved to Cottage Grove in 1975 and have hiked around Cerro Gordo for about forty years. In researching the name of "Cerro Gordo" I found that at least ten places in the United States were named to remember the battle of Cerro Gordo in our war with Mexico. There is a Cerro Gordo County in Iowa. There is also a Cerro Gordo in California, Arkansas, Tennessee, North Carolina and Florida and our own Cerro Gordo, Oregon. The battle was huge in our nation's history at the time. Historians still argue over whether Mexico or the United States started the war. Future President and Civil War hero General Ulysses S. Grant strongly opposed the War. When Texas became part of the United States President Polk sent soldiers to "Secure the Border." In turn, Mexico rallied an army to "Repel the Invaders." War soon followed. The battle of Cerro Gordo was on April 18, 1847. The Mexican commander was General Santa Anna of the 1836 fight at the Alamo, in Texas. The Mexican War became a proving ground for the generals who later fought in the Civil War. Look at this list of names of some of our future military leaders: William Tecumseh Sherman, Stonewall Jackson, George Meade, Franklin Pierce, Ulysses S. Grant, Jefferson Davis and Robert E. Lee. What began as a conflict over the state of Texas turned into a major war. From this fight the US gained the entire Southwest including Arizona, New Mexico and California. The size of America was increased over 60%. In 1848, gold was discovered in California, launching the gold rush. The battle at Cerro Gordo was a key to opening up the now "American" West for the European Immigrants of the 1850's. The map of the United States would look very different today without our war with Mexico. This historical fact is important to remember. Mexico lost over half of its land - a fact that has colored relations with the US to this day. Also, Mexican General Santa Anna lost his wooden leg in the fight. It is now in a museum in the United States. Mexico has repeatedly asked the US to return it. In the late 1800's in Oregon, a Civil War vet named "Lucky" Doolittle obtained the Terrance McMurray donation land claim from the England family. The first sawmill here was called The Cerro Gordo Lumber Company. The Doolittle Family named the ranch "Paradise Hill." They had a successful mill and homestead until the 1920s. They even had a state certified school for the loggers' children. Dorena's own young nature writer, Opal Whiteley taught and hiked there. Today, the old Doolittle wagon roads can still be found on the hill. In 1974, a new group of settlers arrived to start a cooperative community on 1200 acres of what the locals had come to call "Rattlesnake Hill." These latest residents of Cerro Gordo have sought to build a planned village for over 2,000 people living in harmony with Nature. The development never really gotten off the ground but today there are about twenty people who live on the land. The community has an active forestry and silvaculture program. I moved to Cottage Grove in 1975 and have hiked around the Cerro Gordo Ranch for about forty years. At the end of this article are more link videos on You Tube of myself and Cerro Gordo history. Oregon is now in the midst of a cultural expansion from new Hispanic immigrants. Mexican descendants of the war are living alongside descendants of US veterans. Learning about the history of Cerro Gordo Mountain and the Mexican War may help us understand our shared history. 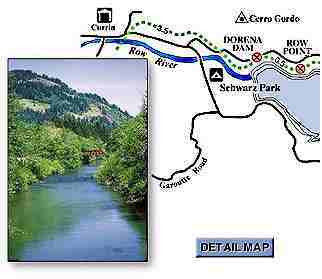 Today, the Row River Bike Trail makes a beautiful way for visitors to enjoy Cerro Gordo Mt. and Dorena Lake. Below is a shorter, printed version of this online article. 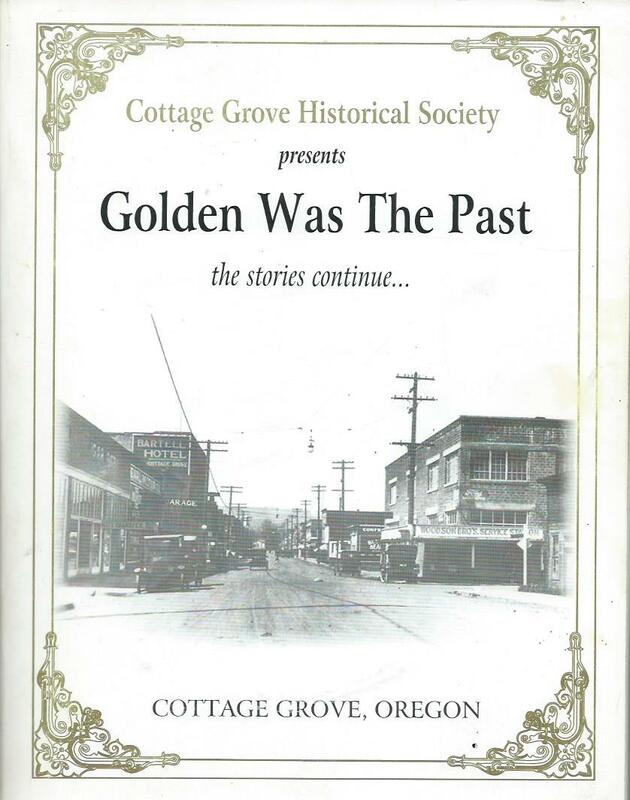 It's from the 2003 Cottage Grove Historical Society's book, Golden Was the Past Volume 2. 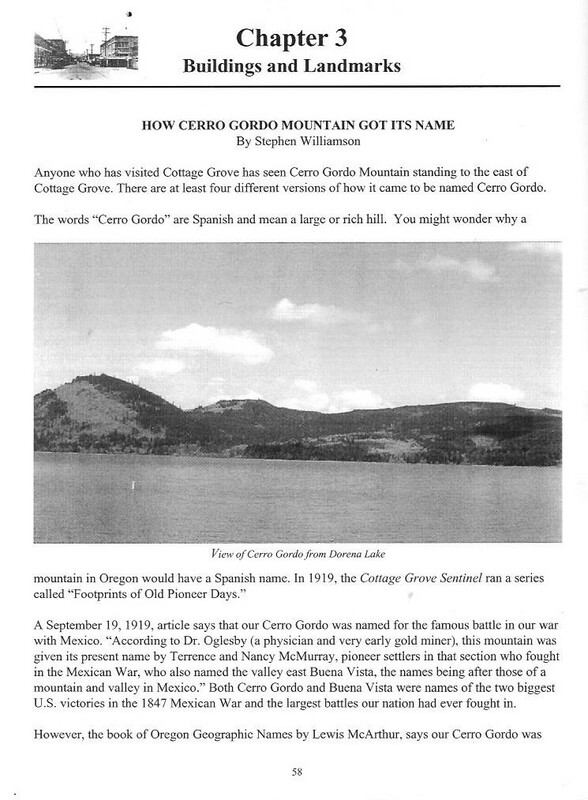 I was honored to be asked to write the town's "official" history of how Cerro Gordo Mountain got it's name. Note the view of Cerro Gordo Mt in the center scan and how similar our mountain is to the one where the famous battle was fought in Mexico. Click on the image to read a larger copy of the story. "On February 22nd and 23rd, 1847, the American army under General Taylor, with General Wool and his men (who had arrived in Northern Mexico by that time), fought a Mexican force led by General Santa Anna, vastly superior in numbers, near the hacienda of Buena Vista. 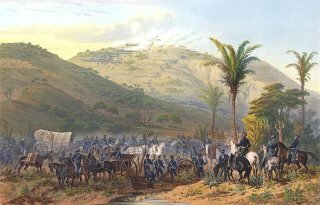 The Battle of Buena Vista (or La Angostura, as it is called in Mexico) was one that could have gone either way for the Americans. It was the single bloodiest battle of the war. Hard pressed on all sides, fighting on some of the roughest terrain any army has ever encountered, it appeared for a while that the Mexicans might prevail. But in the end, Santa Anna withdrew, leaving Taylor with yet another victory to his credit. This added to his stature as a candidate for the Presidency of the United States - a position he was to win in the election of 1848. After Buena Vista, Northern Mexico was relatively quiet as the Mexican army's attention was, of necessity, drawn to the central coast. There, in March 1847, General Winfield Scott's "Army of Invasion," landed at Vera Cruz, the first step towards their ultimate goal: the capital, Mexico City." There are also good videos on the Mexican War on You Tube. Also, ff you search for Cerro Gordo Oregon you can find other videos on YouTube about our Cerro Gordo. Here are some of the lyrics from a song about the battles of Cerro Gordo and Buena Vista. It tells about how the Mexican leader Santa Anna lost his prosthetic leg. The tune is a parody of 'The Girl I Left Behind Me.' Santa Anna's leg is now in now in a US museum. Mexico has repeatedly asked the US to return it. l left no leg behind me." Book of Oregon Geographic Names Entry for "Cerro Gordo"
"Cerro Gordo, LANE. Cerro Gordo is a round hill 2,112 feet high just north of Dorena Dam. In 1903, the Oregon & Southeastern Railroad established Cerro Gordo station near its base. The words are Spanish and mean a rich hill in a mining district, otherwise a fat or round hill. Gordo also means obese. In 1945, Portland attorney John C. Veatch told the writer that a number of veterans of the Mexican War settled in the vicinity of this butte and presumably displayed their knowledge of Spanish by naming the mountain. There is a notion that this hill resembles the one in Mexico where the battle of Cerro Gordo was fought, but Mr. Veatch thought this was improbable and that the real reason for the name was that the slopes are of a golden brown in late summer, giving the appearance of a gold or rich mountain. Mr. Veatch was well acquainted with the locality because he was born there. In 1994, Stephen H. Williamson of Cottage Grove wrote to suggest that it might have been named by Sarah Churchill Knox, who came to Oregon in 1851 from Iowa. There is a Cerro Gordo County in Iowa, but the compiler does not know if that was her birthplace."